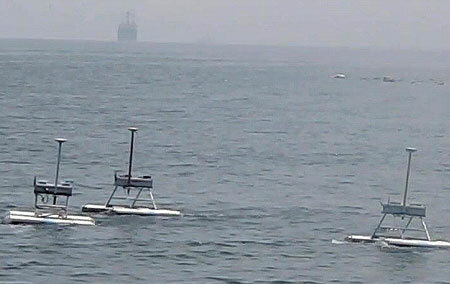 (Nanowerk News) A team led by Korea Advanced Institute of Science and Technology (KAIST) Civil and Environmental Engineering Department’s Professor Hyeon Myeong has just finished testing the cooperative assembly robot for jellyfish population control, named JEROS, in the field. The rising number of accidents and financial losses by fishing industry, estimated at 300 billion won per year, caused by the recent swarm of jellyfish in coastal waters has been a major problem for many years. The research team led by Prof. Hyeon Myeong began developing an unmanned automated system capable of eradicating jellyfishin in 2009, and has since completed field-tests last year with success. Formation Control demonstrated by JEROS. This year, JEROS’s performance and speed has been improved with the ability to work in formation as a cooperative group to efficiently exterminate jellyfish. An unmanned aquatic robot JEROS with a mountable grinding part is buoyed by two cylindrical bodies that utilizes propulsion motors to move forward and reverse, as well as rotate 360 degrees. Furthermore, GIS (geographic information system)-based map data is used to specify the region for jellyfish extermination, which automatically calculates the path for the task. JEROS then navigates autonomously using a GPS (Global Positioning System) receiver and an INS(inertial navigation system). The assembly robots maintain a set formation pattern, while calculating its course to perform jellyfish extermination. The advantage of this method is that there is no need for individual control of the robots. Only the leader robot requires the calculated path, and the other robots can simply follow in a formation by exchanging their location information via wireless communication (ZigBee method). JEROS uses its propulsion speed to capture jellyfish into the grinding part on the bottom, which then suctions the jellyfish toward the propeller to be exterminated. The field test results show that three assembly robots operating at 4 knots (7.2km/h) disposes jellyfish at the rate of about 900kg/h. The research team has currently completed testing JEROS at Gyeongnam Masan Bay and is expected to further experiment and improve the performance at various environment and conditions. JEROS may also be utilized for other purposes including marine patrols, prevention of oil spills and waste removal in the sea.